Monthly data was mixed this week. 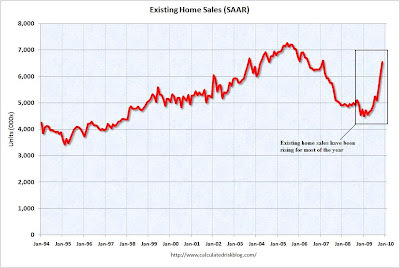 Existing home sales came in higher than expected; new home sales tanked (which may or may not be of a piece with the surprise decline last month in housing permits and starts, which rebounded this month). 3Q GDP was revised down to a merely good 2.2%. The Chicago Fed's index in November improved. 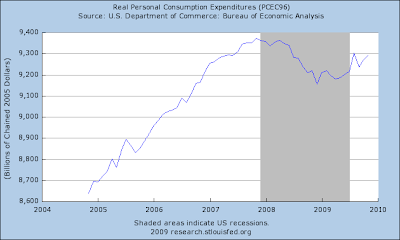 Perhaps most importantly, personal income and spending both increased in November, suggesting 4Q personal consumption expenditures will be up significantly compared with earlier this year. Since last Saturday was the east coast blizzard, it is especially noteworthy that the week still showed a gain. Meanwhile ShopperTrak reported that sales for the week ending December 19 were down -1.2% YoY, although up +20.0% from the prior week. Again, taking into account that the biggest shopping day featured a blizzard in the Megalopolis, this is actually an encouraging report. The BLS reported 452,000 new jobless claims last week, the lowest in 15 months. The 4 week moving average also continued to decline. The E.I.A. reported that gasoline usage continued slightly above last year's level, with prices steady at $2.59/gallon. Oil advanced about $4 to $74 a barrel this week. Railfax reports that rail traffic last week was up +28.1% vs. a year ago. The four week average was up +15.6%. For the 4th quarter as a whole to date, traffic is down -3.1%. Cyclical traffic is now ahead of last year on a 4 week average basis, and has basically reamined steady since mid-3Q, which is very bullish since it almost always starts to decline in October or November. Intermodal traffic is equal to last year. This month's new vehicle sales (including fleet sales) are expected to be 1,010,000 units, a 13.3 percent increase from December 2008 and a 3.57 percent increase from November 2009. 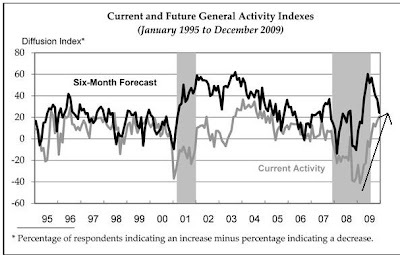 Edmunds.com analysts predict that December's Seasonally Adjusted Annualized Rate (SAAR) will be 11.11 million, up from 10.89 in November 2009. Finally, the December 22 Daily Treasury Statement, at $105,187 B, is about 10% less than the same day last year, which showed $116,642 B in withholding taxes paid for December. (Of note, on the 21st the two years were almost exactly equal). Either way, tax revenues are still in a state of severe stress. 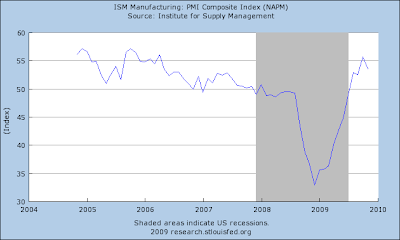 In summary, the economy still isn't out of the woods. But there are increasing signs that consumer and producer spending are improving significantly, a good sign for employment going forward. Most importantly of all, best wishes for a very happy holiday! The BLS reported that for the week ending December 19, seasonally adjusted initial jobless claims fell to 452,000, down from last week's 480,000. 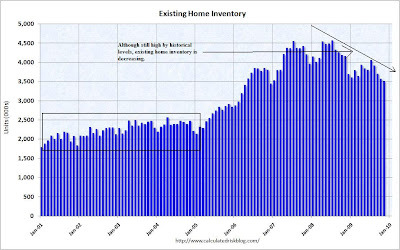 The 4-week moving average is now 465,250, compared with 468,000 last week. The 4 week seasonally adjusted moving average is now about 31% lower than the peak of 658,750 on April 3 of this year. (The last two "jobless recoveries" coincided with new claims declining no more than 20% from peak). Unadjusted, there were 561,902 new claims, an increase of 6,942 from the week before, showing how much seasonal volatility exists in the weekly numbers at this time of year. 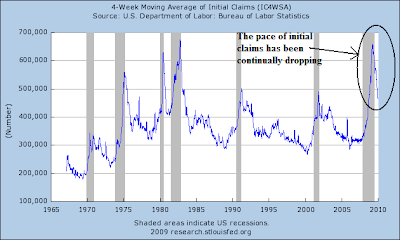 Today's reading is well below the initial claims numbers for this time last year, and seasonally adjusted is the best number in 1 year and 3 months. In summary, based on my prior research, initial jobless claims are continuing to suggest that actual job growth is taking place in the economy this month. Gains outside of transportation were broad-based, with increases in demand for machinery, metals, computers and communications gear. Shipments of non-defense capital goods excluding aircraft, which is used in calculating gross domestic product, climbed 0.8 percent in November and October’s reading was revised to show a 1.5 percent jump, compared with a previously estimated 0.3 percent drop. Bookings for such goods, a proxy for future business spending, increased 2.9 percent in November. The figures suggest business investment will contribute to growth. 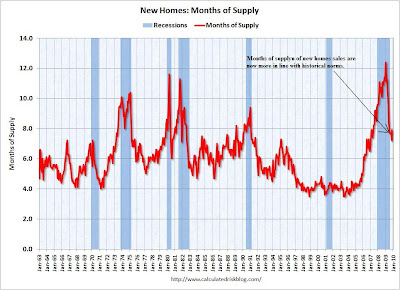 While we still don't have figures for several items in the LEI, between expanding positive bond yields, declining new jobless claims, and a rebound in housing permits and consumer sentiment, it is beginning to look like December's LEI could be a blowout, which would give us close to the highest YoY reading on the LEI in over 25 years. This would put the Conference Board's measure in the same territory as ECRI's long leading indicators, which already reached their highest point since 1982 this autumn. My father gets in town later today, so the family festivities will be cranking up. I'll be back on Monday. To all the readers of this blog, have a very Merry Christmas. And don't think about stock charts or economic numbers during the process, OK? 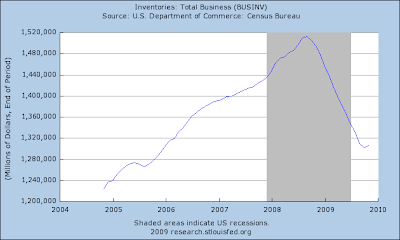 Real gross domestic product -- the output of goods and services produced by labor and property located in the United States -- increased at an annual rate of 2.2 percent in the third quarter of 2009, (that is, from the second quarter to the third quarter), according to the "third" estimate released by the Bureau of Economic Analysis. 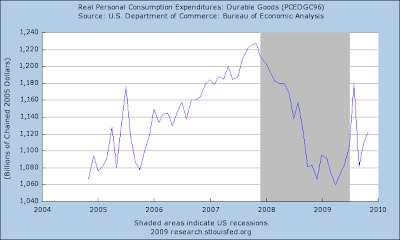 In the second quarter, real GDP decreased 0.7 percent. The GDP estimate released today is based on more complete source data than were available for the "second" estimate issued last month. 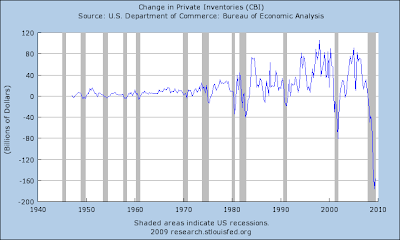 In the second estimate, the increase in real GDP was 2.8 percent (see "Revisions" on page 3). 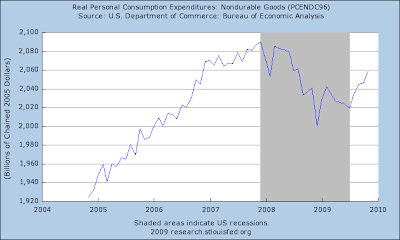 The upturn in real GDP in the third quarter primarily reflected upturns in PCE, in exports, in private inventory investment, and in residential fixed investment and a smaller decrease in nonresidential fixed investment that were partly offset by an upturn in imports, a downturn in state and local government spending, and a deceleration in federal government spending. The original release put this at an increase of 3.5%. 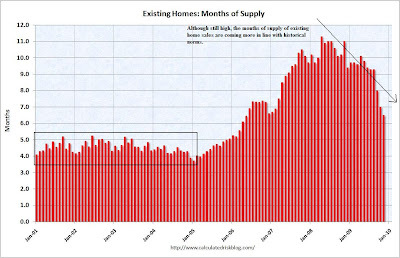 This was followed by a lowered revision of 2.8% last month. However, GDP decreased at a .7% rate in the second quarter. In addition, this was the first increase in the last 5 quarters. That still makes this good news. There were some good numbers within the report. 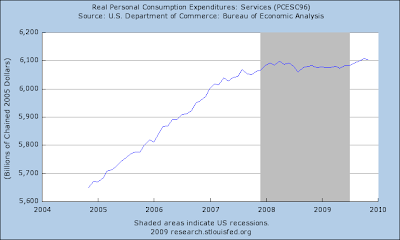 Personal consumption expenditures increased 2.8%. While durable goods purchases increased 20.4%, non-durable goods purchases increased 1.5% and services purchases increased .8%. Also note that durable goods are by far the smallest component of PCEs, coming in at 10.37% while services account for 67.5%. Residential investment increased 18.9%. 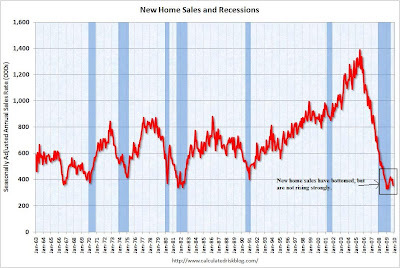 This is very important as it indicates that real estate is no longer a drag on economic growth. In addition, equipment and software investment increased 1.5%, indicating that businesses are tooling up. This helped gross private domestic ivestment increase 5% for the quarter. In addition, exports increased 17.8% indicating our trading partners are buying things again. However, imports increased 21.3% so the trade gap widened. 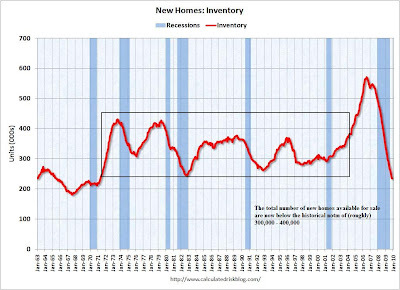 Inventories have dropped like a stone for roughly a year. At some point these will need to be replaced. While there is no indication the bottom has occurred yet at some point it will. And when that happens, another item of growth will be added to the equation. 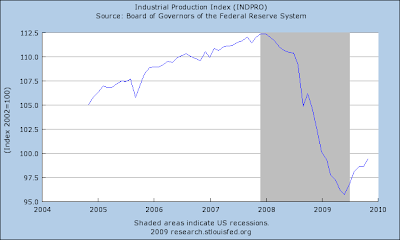 Short version - the recession is over. The only people who think this is a big deal of some sort, are the same people who never saw positive GDP coming in the first place. Had the number been originally reported in October as +2.2% and remained there, I would have considered it a good report. Instead, we originally got a surprise "great" number, and then ultimately the final number wound up close to the original forecasts. It remains a great turnaround from earlier in the year, when most observers thought we were falling into a bottomless abyss. 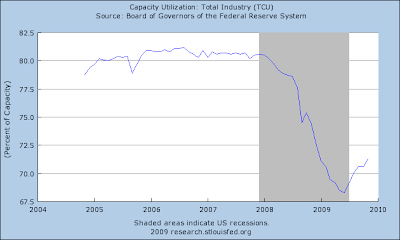 For the DBBs, note the overall trend is up. There has been consolidation along the way in the form of consolidation rectangles and flags, but overall we're still moving higher. Also note the overall EMA picture -- the shorter EMAs are above the longer EMAs, all the EMAs are moving higher and prices are using the EMAs are technical support. A.) Momentum is about even -- there is no move either way. B.) The A/D line tells us that volume is still flowing into these shares. 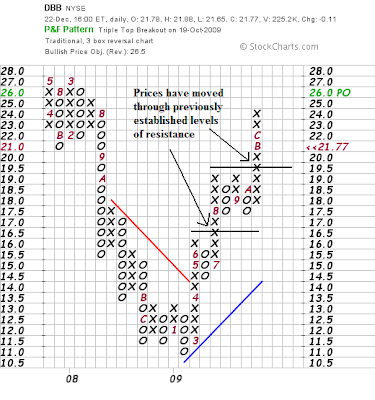 On the P&F chart, note that prices have continued to move through upside resistance for the entire year.